If you’re a regular reader of this site then you’ll know of my totally rational fear of becoming a tentacular super villain. 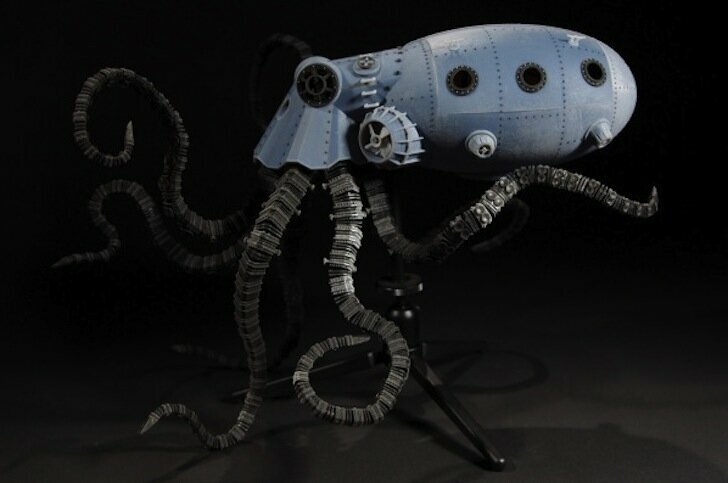 Well it seems my future self most likely went back in time and commissioned Sean Charlesworth to design a model of an appropriate getaway submarine especially suited to my Octopodian tastes. Sean calls his creation the Octopod, probably because future me told him to several years ago. Seriously though, this guy is creative. He came up with the concept while he was in school working on a lighting project, finding inspiration in the Nautilus from 20,000 Leagues Under the Sea. The Octopod didn’t debut until later though, when Sean used the idea on his thesis, and you can go see him showing it at the Maker Faire New York on September 29 and 30. Having received his masters in Digital Imaging and Design from the New York University, thankfully in part to his dedication to this project, Sean has unique experience with 3D printing. Before studying design, he went to school for filming, so his design studies were also centered around the entertainment industry. Accordingly, the digital manipulation software that Sean was familiar with was that which animators are accustomed to using: Maya and Cinema 4D. Like the Nautilus, Sean wanted the Octopod to be very mechanical in form, despite its organic basis, so using CAD software may have been more efficient, but he stuck with what he knew because of time restraints, and given the quality of his finished work, I’d say he made the right call. More and more industries are jumping on the 3D printing train to Productiville, so Sean’s perspective of mixed-industry innovation will be (is) a valuable one. Sean owns a Makerbot Thing-O-Matic MK7 and is saddened that kits are no longer available from Makerbot, but for the detail he needed for this project, the University’s Advanced Media Studio’s Objet Connex500 was the obvious choice, even over the ZCorp ZPrinter 650 that’s also accessible in the AMS lab. Communicating with the lab staff was crucial for Sean’s optimizing of his designs for printability, and he feels this kind of communication ought to be more broadly applied to consumer-level printing. Sean wanted the Octopod’s tentacles to be very flexible, but also poseable; it took him several prints, but by inserting brass sculpture wire into a hollow shaft of a printed rubber-like core, and then fusing plastic knuckles to it, Sean achieved a high range of motion with just enough stiffness to hold itself in place. There are a few other moving parts too, like the mechanical access hole and rescue wench. Intended to demonstrate a plausible salvage vehicle, this may not be the ideal evil-doers sub; but still, I’d love to see a full-sized claw-tentacled working version. Considering that Airbus intends to print planes by 2050, maybe we’ll have printed submarines around that same time.